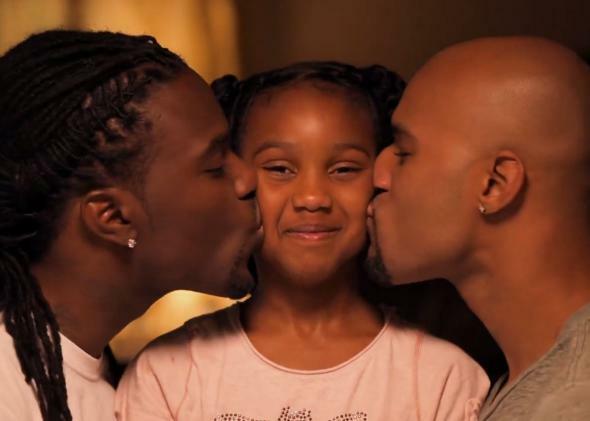 Kordale and Kaleb with their daughter. Remember Kordale and Kaleb, the web-famous gay couple from Atlanta, Georgia? They came to the Internet’s attention early last year when an Instagram picture of their morning routine with their three children went viral, bringing a rush of attention, both positive and negative. While many commenters offered support for the family, others trotted out the usual homophobic opinions, namely that gay men should not be allowed to raise kids. At the time, Kordale and Kaleb defended the legitimacy of their family in the strongest terms (some troubling talk about sleeping in separate bedrooms so that they would appear as friends to their children notwithstanding), and went on with their lives. Now, Kordale, Kaleb, and their kids are back in a beautiful ad campaign for Nikon, titled “I Am Generation Image,” in which six people “with something to say” were provided with high-end cameras to record their experiences. Quite right; but based on the glimpse that the couple has offered in this video, it looks like they and their children are living pretty well.